So What's John Bel Edwards' Position On Ralph Northam? So What’s John Bel Edwards’ Position On Ralph Northam? That’s a question we’d all like to know the answer to. So far we’ve not seen a statement from Edwards, who like Northam is one of the few Southern governors with a “D” next to his name, about the latter’s recent self-inflicted troubles. Frankly, we’re more interested in Edwards’ thoughts about Northam’s statements which seem to support infanticide than his old medical school yearbook photo in blackface (something Northam denies, though he did offer up the previously-unknown fact that he’d appeared in blackface another time during a dance contest where he attempted to mimic Michael Jackson). The blackface bit is what’s getting all the attention, and if Northam is forced to resign as Virginia’s governor it’ll be as a result of that 35-year old college idiocy – something which disturbs us a bit, since we’re a lot more put off by the fact that this man, after being sworn in as governor more than a year ago, actively supports legislation legalizing the killing of babies literally on the day they’re born, and even after the birth. Which is a lot more monstrous than a 35-year old tasteless photo involving shoe polish and a lack of couth. Nonetheless, we want to know where John Bel Edwards comes down on Northam. Well, because where fundraising is concerned they’re joined at the hip. After all, last year Northam hosted Edwards for a big-dollar fundraiser in Virginia which raised well more than $100,000 for Edwards’ re-election campaign. Northam was joined by lefty author (and former Mississippi Democrat state legislator) John Grisham, plus Virginia’s former governor and Democrat rainmaker Terry McAuliffe. So if JBE were to repudiate Northam, that would be the end of his being able to tap him for campaign cash – though since McAuliffe has called on Northam to resign perhaps he could pitch in for the ruptured-duck Virginia governor in future fundraising adventures. Both Jones and Salim were $5,000 individual donors to JBE in the 2015 race, and they’re both tied to him. Salim was also a $7,500 donor to Foster Campbell’s Stronger Louisiana PAC in 2016, which Edwards did a great deal of the fundraising for. In other words, Edwards and his guys made sure to grease Northam with campaign cash and then Edwards got repaid in kind. So again, we’d love to know what JBE thinks about what ought to happen to Ralph Northam. 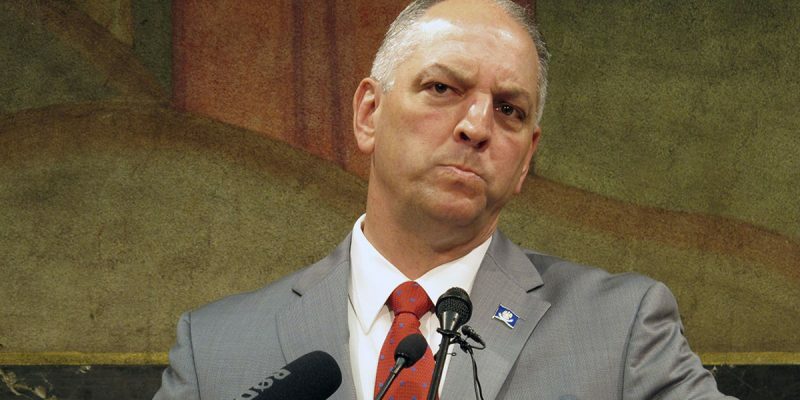 We’re pretty sure none of the state’s mainstream media will bother asking him, though – since they don’t ask John Bel Edwards inconvenient questions. Instead they’re too busy howling about meaningless votes Ralph Abraham missed in Congress while he started his gubernatorial campaign or slurring Eddie Rispone’s poster for having done work in campaigns Paul Manafort also worked on. Now comes the follow-up – which is whether Edwards repudiates the fundraising efforts Northam made on his behalf – since that money is obviously tainted by racism based on that “disgusting” and “offensive” photograph. Interesting that Edwards, who touts himself as pro-life, hasn’t said much about Northam’s comments on infanticide.